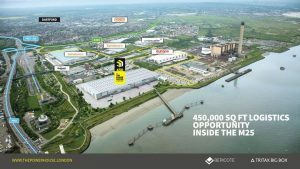 Tritax Big Box REIT and Bericote Properties have secured planning permission for a 450,240 sq ft logistics facility at their Dartford Power Station scheme. The proposed development of the asset is on 28.6 acres of phase 1 land at Littlebrook, located within the M25, and consolidates planning consents from other parts of the site. Tritax Big Box said it was targeting a yield on cost on phase 1 in excess of 6.5%. The wider 114-acre site can support the potential development of around 1.7m sq ft of logistics distribution buildings, including several big box logistics facilities together with some smaller urban logistics facilities. Tritax Big Box said it had attracted a “healthy level” of enquiries on the wider scheme and expected heightened interest in phase 1. The JV partners will develop buildings on a pre-let basis only on this site. Demolition of both phases 1 and 2, which total around 54 acres, has now completed. The demolition of phase 3, which includes the main power station and its associated infrastructure, is continuing and is on track to complete in early 2020. Discussions are now ongoing with Dartford Borough Council for a separate application for outline planning consent on the balance of the site. Colin Godfrey, partner of Tritax, said: “Working alongside our development partner, Bericote Properties, we are delighted to have been granted planning permission for the first development phase of this exciting big box logistics park within the M25 at Dartford, London. “The development team look forward to continuing to build on the positive working relationship established with Dartford Borough Council to progress discussions to secure planning consent for the development of the balance of this site. We anticipate being able to provide additional new high-quality investments on a pre-let basis to the company’s portfolio over the coming years at an attractive yield on cost.